Skyline Windows, Products - Windows, Doors and Conservatories, in Eastbourne. PORCHES, CONSERVATORIES, GLAZING, UPVC Double Glazed Windows and Doors, Fascias, Soffits, Guttering and Cladding. Skyline Windows Eastbourne only use the highest quality products. We install and fit Windows, Doors, Conservatories, Porches, Patio Doors, Cladding, Soffit and Fascia, and much more. We offer free quotations as part of the excellent service we've provided for over 15 years in East Sussex and the Eastbourne area. Why not call us now to get the ball rolling? 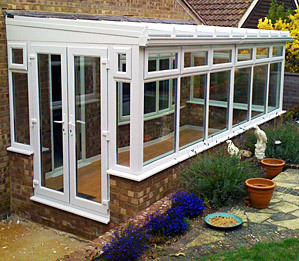 Wide range of styles of Porches and Conservatory available in UPVC. Custom designed by our team to fit your every requirement. A range of decorative glass for you to choose from. A superior choice of roof systems and glazing options, aiding you, with our help to customize your personal design to your every need. All ground work can be factored in to your FREE quote by us; which avoids the extra work of finding a separate quote elsewhere for it. Don't forget our FREE FORMAL QUOTATIONS with plans included! CONSERVATORIES and PORCHES - Every Skyline Windows Conservatory and Porch is designed for you and only you. Investing in a Conservatory or Porch can be a complicated process but at Skyline Windows of Eastbourne we will guide you gently through the experience. 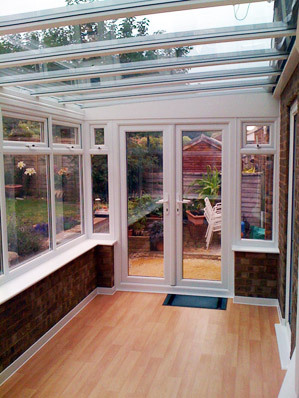 We'll take time with you to make certain that the Conservatory you want is the Conservatory that you get. There are many options to choose from and Skyline Windows will help you choose wisely. For a free, no-obligation quotation for your Conservatory or Porch, please contact SKYLINE WINDOWS today on - TEL: 01323 730247 or MOBILE: 07815 908287. Skyline Windows have a large variety of Windows to choose from, in a larger variety of colours and styles. They can be internally or externally beaded to a 60mm or 70mm profile. Front doors, French doors, Patio doors, Composite doors are all available in a wide range of colours and designs. 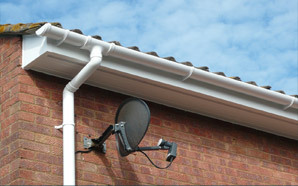 You can take away the hassle of maintenance and the worry of painting and repair by replacing your Soffits and Fascias and Guttering with UPVC. No longer will you have to budget for repair and so substantial savings can be made by installing this trouble free product. No more days or money spent preserving wooden Soffits and Fascia and old Cast Iron Guttering by the painting and staining necessary to keep wood and metal in good order. No more nasty surprises from Warping and Rotting wood. No more problems with leaking water or insect infestation. Trouble free surfaces that add style to the exterior of your home, while saving you money. Available in white or wood grain, with a choice of ventilation systems, either by a continuous vent or a series of disc vents. For a free quote for Soffits, Fascia and Guttering, please contact SKYLINE WINDOWS today on - TEL: 01323 730247 or MOBILE: 07815 908287. COMPETETIVELY PRICED PRODUCTS AND SERVICE FROM A LOCAL FIRM WITH 15 YEARS EXPERIENCE.